The friend who hosted the brunch is expecting her first bundle of joy this September and another friend of ours is expecting her first in just 10 days! So I really wanted to make something that was versatile enough to be a cocktail or a “Mommy Mocktail”. This fit the bill and was a big hit with everyone – expecting or not! A light and fruity punch, perfect for a Sunday brunch with friends or hot summer nights on the patio. Easily adaptable to be boozy or booze-less. Pour nectar, lemonade, and lime juice into a large punch bowl. Thread lemon slices onto the Rosemary stem (pick one of the sturdier ones that can handle the weight of the lemons slices). 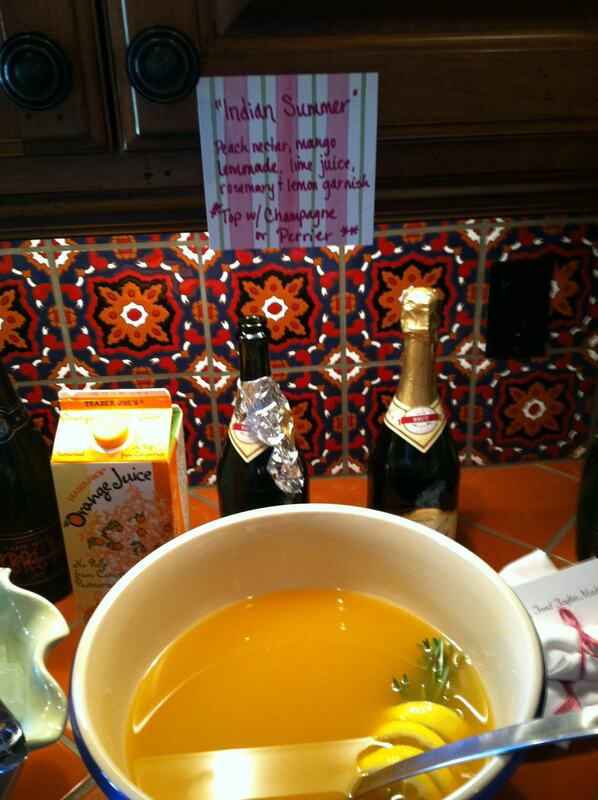 Put the lemon-rosemary garnish into the punch bowl. Fill ¾ full with punch. Top with either Champagne or Sparkling Water.